Dr. John Huang was born in Taiwan and came to the United States at the age of seven. He has lived in the Houston area for about thirty years. He attended St. Mary’s University and received his Bachelor of Science in Biology and minor in Chemistry. Upon completing his undergraduate studies he enrolled as a student at Texas Chiropractic College where he earned a Doctorate of Chiropractic. He is certified in CPR by the American Heart Association. He is a member of American Chiropractic Association, and Texas Chiropractic Association. In our attempt to ensure the highest quality service for you and our Chiropractors we decided upon this process. 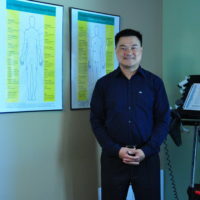 After filling out the form we call Dr. John Huang and then connect you into the call, ensuring you don't end up speaking with an answering machine.